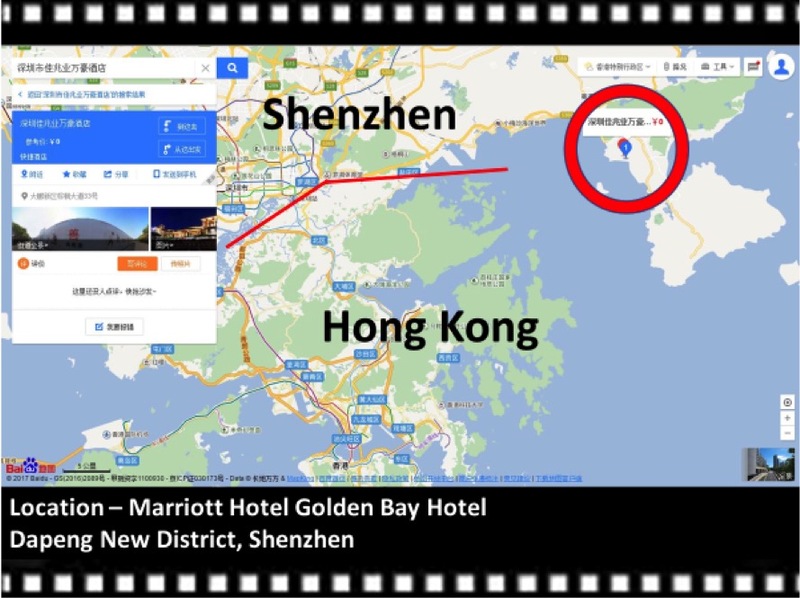 EDSSC 2018 will be held in the Shenzhen Marriott Hotel Golden Bay Hotel. For booking, please call Celia, the Hotel Manager at 18665817954. The hotel enjoys a prime location on the beachfront Golden Bay – one of the top eight domestic bays in China according to the China National Geographic Magazine. Just opened in June, it offers 325 spacious guest rooms and suites, featuring panoramic sea views, as well as high-speed Internet access and high-tech facilities. The modern interiors take cues from the local culture, combining elements from the Dapeng Fortress as well as Shenzhen’s fishing village heritage. The nearest downtown is about 4km away. Taking another 4km will bring you to the historical remains of the “Ancient Dapeng Fortress Town”, which was built in the Ming dynasty to defense the pirates. The hotel offer special discount of with a rate of RMB900/800 per night for sea-view and inner view respectively to the conference attendees. To enjoy the special rate, please click the link below. The offer will cease after May 15 or when all the available rooms sold out. 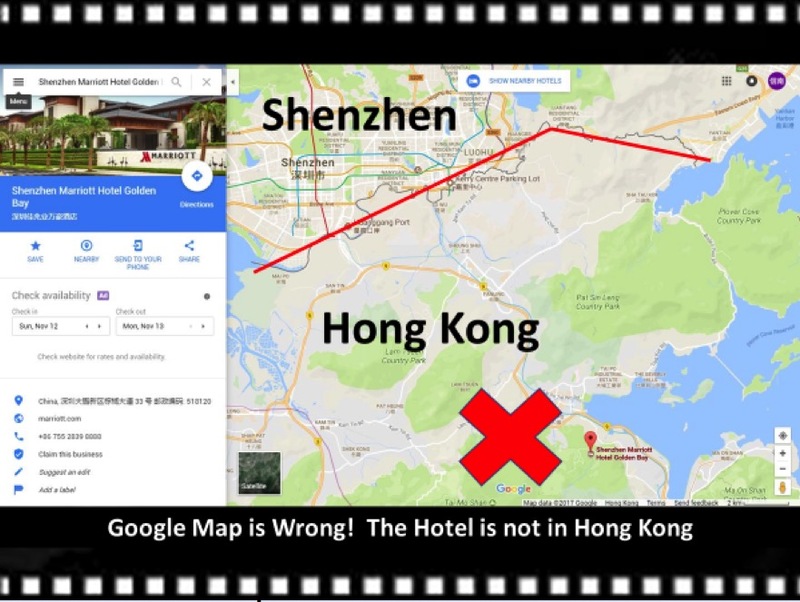 As the hotel was just opened in June 2017, google has incorrectly indicated the hotel location in Hong Kong. It is actually in Shenzhen. If public transport is preferred, you may take Bus E30 (Airport New Terminal - Union Square), then Travel Line 5 (Union Square - Dapeng Bus Station), then Dapeng Jinsha Bay Tourist line (Dapeng - Jinsha Bay Tourist Area). It will take another 412 mitter walk to get to the hotel. It takes about 2.5 hours with CNY26.00 plus about 1.1km walking. To take the shuttle bus, please take West exit on HePing Road at the Shenzhen Luo Hu Station. You will see our conference helpers there with a ‘EDSSC 2018’ sign board. Due to local parking restrictions, the bus will not park near the station. Please wait at west exit with our assistant, the shuttle bus will come and pick up passengers at west gate 5 minutes prior to the departure time. The hotel is about 53.3km away and one-way taxi fare is about CNY 137. The travel time is approximately 1 hour. 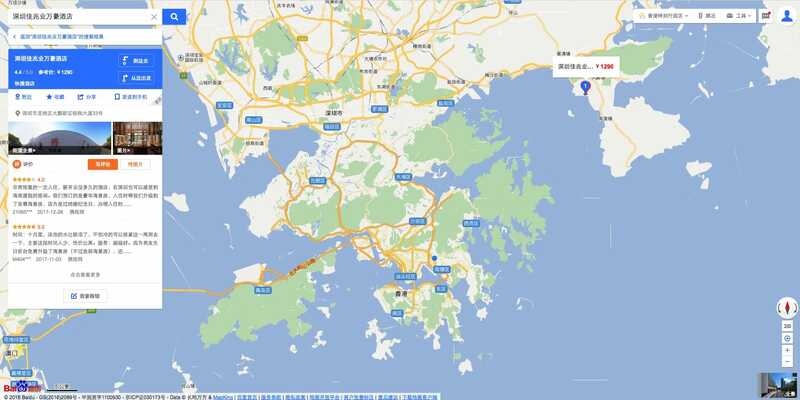 To take the bus, first take the Dapeng Jinsha Bay Tourist Line (Lowu Hospital - Jinsha Bay Tourist Area) followed by about 412 meter walk to the Hotel. It takes about 1.5 hours, 1.8 km walking and cost about CNY 12. To take the shuttle bus, please find Long-Distance Bus Terminal located at West Plaza of the station. 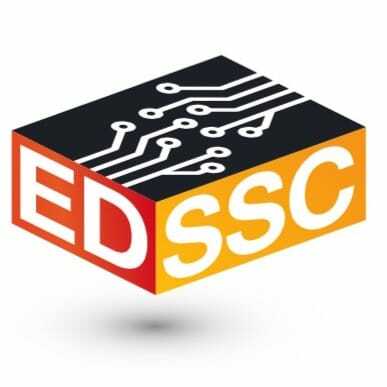 You will see our conference helpers there with a ‘EDSSC 2018’ sign board. They will guide you to the shuttle bus and answer your inquiry. The shuttle bus will be located at the Long-Distance Bus Terminal. The hotel is about 65.5km away and one-way taxi fare is about CNY 184. The travel time is approximately 1 hour. 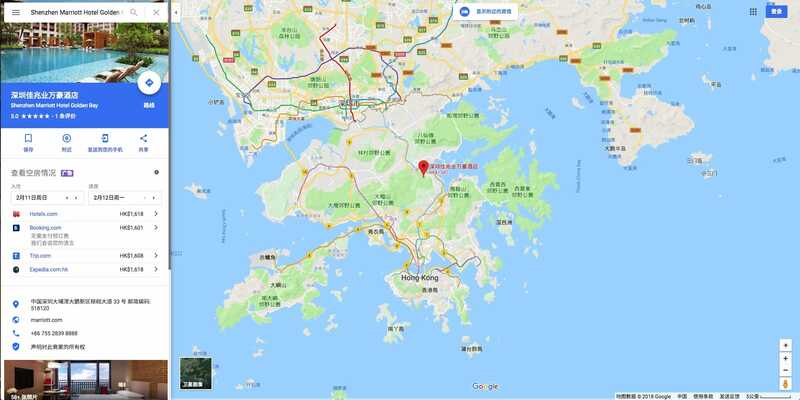 To take the bus, first take the bus E1 (Shenzhenbei Railway Station - Kuiyong Centere), then by the Dapeng Jinsha Bay Touorist Line (Kuiyong Center - Jinsha Bay Tourist Area) followed by about 412 meter walk to the Hotel. It takes about 1 hour, 0.8 km walking and cost about CNY 15. The hotel is about 59.4km away and one-way taxi fare is about CNY 156. The travel time is approximately 1 hour. To take the bus, first take the Tour Line 5 (Exhibition Center South - Dapeng Bus Station), then by the Dapeng Jinsha Bay Touorist Line (Dapeng - Jinsha Bay Tourist Area) followed by about 412 meter walk to the Hotel. It takes about 2 hours, 1.7 km walking and cost about CNY 16. The hotel is about 84km away and one-way taxi fare is about CNY 218. The travel time is approximately 1.5 hours. 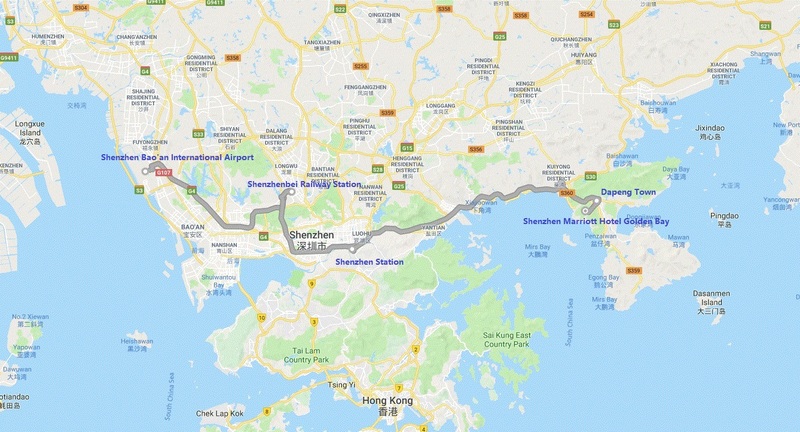 To take the bus, first take K113 (Shekou Subway Station - Liantang), then by the Dapeng Jinsha Bay Touorist Line (Liantang - Jinsha Bay Tourist Area) followed by about 412 meter walk to the Hotel. It takes about 3.5 hour, 0.5 km walking and cost about CNY 14.